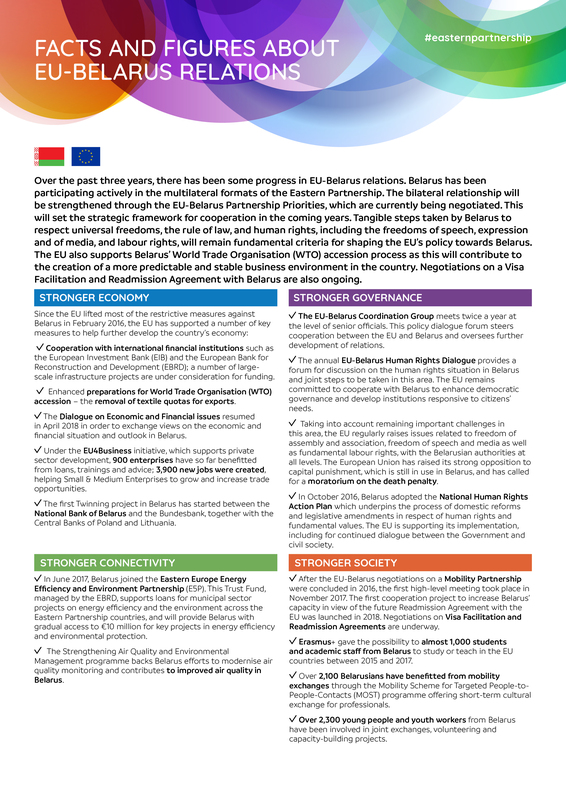 Over the past three years, there has been some progress in EU-Belarus relations. Belarus has been participating actively in the multilateral formats of the Eastern Partnership. The bilateral relationship will be strengthened through the EU-Belarus Partnership Priorities, which are currently being negotiated. This will set the strategic framework for cooperation in the coming years. Tangible steps taken by Belarus to respect universal freedoms, the rule of law, and human rights, including the freedoms of speech, expression and of media, and labour rights, will remain fundamental criteria for shaping the EU’s policy towards Belarus. The EU also supports Belarus’ World Trade Organisation (WTO) accession process as this will contribute to the creation of a more predictable and stable business environment in the country. Negotiations on a Visa Facilitation and Readmission Agreement with Belarus are also ongoing.